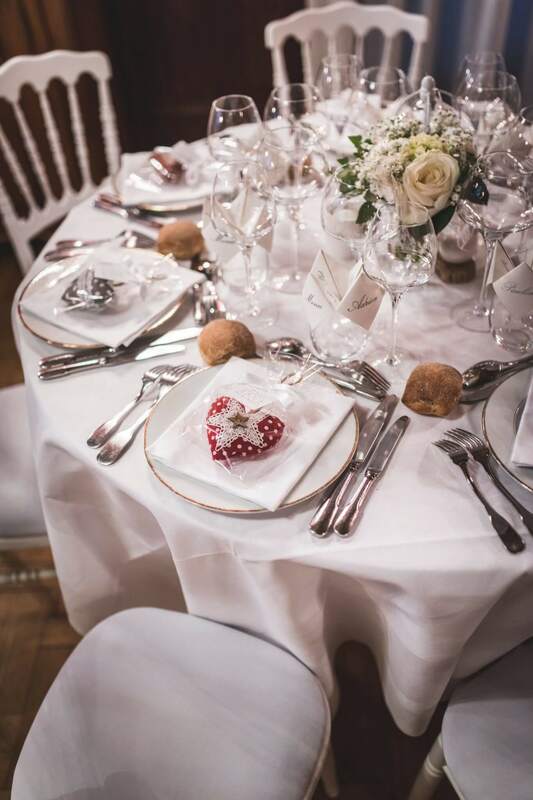 So, we thought that here at one of the leading French wedding venues, Château Bouffémont, we would explore some ideas for what may be your own looming festive nuptials. The flowers that you choose for your Christmas wedding can do so much to add to the seasonal feel of the occasion. Red roses are a consistently great choice for those who desire a classic look, but the likes of white roses, orchids and tulips are also ideal for evoking that crispness we all associate with the colder months. You might have noticed that we’ve been sticking to a white and red palette so far, but you don’t necessarily need to feel constrained by this – a deep burgundy or purple bouquet can also look utterly beautiful, for example. The Hitched website has some more great ideas for your winter wedding flowers. For an especially lovely finishing touch, what about also having some mistletoe hung above the altar for your first kiss as newlyweds? Is your hair and beauty routine ‘winter-ready’? One other aspect of winter weddings that couples can sometimes overlook is the greater difficulty often posed to one’s hair and beauty regime. The good news is that with a little knowledge, you can take advantage of the stunning backdrops that winter weddings make possible while also looking amazing yourself. If you plan to have flowers in your hair, for instance, you will want to ensure they are winter blossoms, such as winter aconites or snowdrops, that can be depended on to survive through the cold conditions without wilting. Those with naturally dry skin may also suffer flare-ups of this problem in cold weather, which is why, if you are such a person, you might want to emphasise this to your make-up artist in advance. If cold conditions also make your cheeks look a little rosier than usual, we would urge you to wear foundation with plenty of coverage to guard against an overly flushed appearance on the day. You don’t need to abandon your hopes of a wearing a gorgeous traditional wedding dress down the aisle simply because the weather looks likely to be adverse. It’s actually not necessarily that difficult to reconcile the two competing priorities of what looks good and what will keep you warm. Even in very cold conditions, for instance, if your wedding dress is long, you might not need to undertake many modifications to it other than wearing thick tights underneath. However, footwear is also a vital consideration, with boots being a both practical and stylish option a lot of the time. Don’t forget to also have cover-ups ready for the bridesmaids, together with velvet blazers for the groomsmen. After all, those who have come to support you on your big day deserve to be looked after in the adverse conditions, too. On the subject of bridesmaids, these autumn and winter looks suggested by Wedding Ideas magazine may interest you. With its refined elegance, spectacular manicured French gardens and a fully dedicated staff team on hand at all times, Château Bouffémont can be the fairytale venue for your own Christmas nuptials. For more ideas about how to make your winter wedding truly special this year, why not browse our Wedding Inspirations photo gallery or consult our previous blog post on five more great ways to make your seasonal nuptials utterly idyllic? Alternatively, why not simply request our wedding brochure today to learn more about what makes our private venue so luxurious and prestigious as a place to tie the knot right through the year? Our venue’s enchanting setting, the atmospheric crackling sound of the fireplace and the stunningly sophisticated decor with hanging chandeliers means there really couldn’t be a more captivating backdrop on which to formalise and celebrate your union in December or January.